It seemed serendipitous to have Portent suggest a title for this blog post that sounded a lot like Julie Dirksen could have written it as an example of bad teaching. Even still, my cursory understanding of Amish community life suggests that the Amish might have something to teach educators using digital tools about building strong communities. A significant point gleaned from Chapman, Ramondt, & Smiley (2005) is that building strong communities takes time. They write in conclusion, “It suggests that taking the time at the beginning of a course to develop rapport online is a crucial investment in ensuring the quality of the learning, and that online learning which focuses on content but discounts community will have more difficulty in generating a deep learning experience for students” (Chapman et al., 2005, p. 226). During our Week 2 synchronous session, I grumbled to myself that an hour-long check-in seemed so excessive. While it still seems that it was too long and that perhaps there might be better ways to accomplish the goal (like having half of the class answer one week and the other half the next week, or by having breakout groups for check-in with a summary presented to the entire class), my criticism has been tempered by reflection on the importance of building community. I am left wondering if there is research that provides guidance on the structuring and blending of synchronous and asynchronous interaction. A cursory search uncovered two promising articles, noted in the Further Reading section below. Chapman et al. (2015) comment that the challenge of building community is particularly acute in higher education due to scheduling pressures. From that perspective, the 8-week long, online learning courses that we develop at Horizon seem much too short to develop a strong community; however, Akyol, Vaughan, & Garrison (2011) found that, with design, community developed in unique ways in both short- and long-term courses. 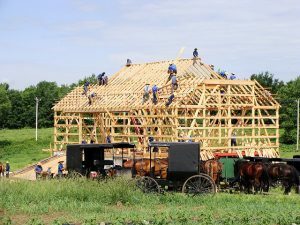 The Amish understand the need for time to build community and structure their lives to create the necessary time (Junkins, 2014). While Chapman et al. (2005) make this point, as the title of their article suggests, the importance of strong communities for learning is the essential message of Chapter 2 of Dron and Anderson (2014). In this chapter, they trace the development of pedagogies of instruction, construction, and connection. A unifying theme of these various pedagogical approaches is that they all depend on a community to a greater or lesser degree. Many instructivist pedagogies, with less emphasis on the role of community, acknowledge that learning usually requires the involvement of others. At the other end of the spectrum, connectivists expand the scope of the learning community to account for such things as mediating artifacts and rules (Activity Theory, Dron & Anderson, 2014, p. 51), and confounding variables, wasps, and thunderstorms (Complexity Theory, Dron & Anderson, 2014, p. 53-54). Strong communities make the common features of social constructivism possible (Dron & Anderson, 2014). The features of multiple perspectives and dialogic engagement, authentic contexts, and inquiry and open-ended, ill-structured problem-solving exist in the social interactions between people. The Amish typically end formal education after Grade 8, seemingly indicating that they understand that learning is not restricted to formal education. Learning for Amish youth and adults continue in the open-ended, ill-structured problems inherent in the authentic contexts of strong communities (Junkins, 2014). Diversity is implicit in the understanding of a learning community promoted by Dirksen (2012). Vygotsky’s concept of the More Knowledgeable Other is clear as the learning designer assesses the gaps that make the learner’s journey necessary (Chapter 1), the characteristics of the learners (Chapter 2), and the destination and duration of the journey (Chapter 3). The concise statement that your learners are different from you encapsulates the diversity concept. In the Blackboard forum, I reflected how problematic technological and cultural assumptions about learners could be. Equally problematic are the assumptions about cognition. Dirksen (2012) cautions that a significant problem occurs when experts forget what it is like not to know and not to have shelves on which organize the knowledge.However, so far we’ve only acknowledged the diversity implicit in a learning community. Dron and Anderson (2014) build their theory of transactional control on Moore’s theory of transactional distance. They argue that increasing transactional control through learner autonomy decreases the transactional distance. 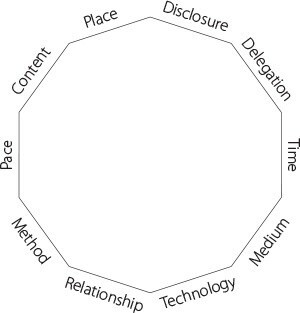 Building on Paulsen’s hexagon of cooperative freedoms, they develop a more robust decagon of freedoms. These choices create the potential for significant diversity in the learning community. However, as in any community, tensions exist, and freedoms must be negotiated within the constraints of the learning community. The binding cause is a common vision of the learning objectives. Somewhat surprisingly, the Amish communities are not monolithic. Even in their acceptance and rejection of technology, there are significant differences. Their communities reflect diversity while sharing a common vision (Junkins, 2014). However, so far we’ve only acknowledged the diversity implicit in a learning community. Dron and Anderson (2014) build their theory of transactional control on Moore’s theory of transactional distance. They argue that increasing transactional control through learner autonomy decreases the transactional distance. Building on Paulsen’s hexagon of cooperative freedoms, they develop a more robust decagon of freedoms. These choices create the potential for significant diversity in the learning community. However, as in any community, tensions exist, and freedoms must be negotiated within the constraints of the learning community. The binding cause is a common vision of the learning objectives. Somewhat surprisingly, the Amish communities are not monolithic. Even in their acceptance and rejection of technology, there are significant differences. Their communities reflect diversity while sharing a common vision (Junkins, 2014). Perhaps you might come up with 33 more. This post is the third in a series (first, second) for this semester’s course, “Digital Tech in Adult Ed,” with Dr. Rob Power at UOIT. Dirksen, J. (2012). Design for How People Learn (Voices that Matter). Berkeley, CA: New Riders, Kindle edition. Junkins, S. (2014, February). Lessons from the Amish. Learning & Leading with Technology, 41(5), 38+. Ediger, M. (2005). Old Order Amish philosophy of education. Education, 125(3), 422+.